A versatile all-in-one Pod vaporizer, Yocan Evolve 2.0 brings to you the ultimate vaping experience, allowing you to switch from e-juice to oils or concentrates. It is another innovative vaporizer from one of the most popular and best vape manufacturer in the world, Yocan. You don’t have to use anything else because Yocan Evolve 2.0 has got you covered, so you can change flavors with its three refillable pod options. Yocan 2.0 is truly a breakthrough pod-based vaporizer! If you’re interested head on to yocanvaporizer.com for more information. Why are new and experienced vapers talking about Yocan Evolve 2.0? What are the best features of this vaporizer? What makes it unique and suddenly popular? Is it worth the money? Let’s find out! At first glance, you’ll be impressed with the simple, compact, and simple design of Yocan Evolve 2.0 vaporizer. The different color options give you the flexibility to choose the best color according to your preference, mood, or outfit. Once you start to use it, you’ll find that the device has smart and excellent features for a straightforward vaping experience. And once you get used to it, you’ll realize how portable, versatile, and convenient the Yocan Evolve 2.0 is. It is a perfect everyday vaping buddy you can always rely on to take a quick dose of your favorite material! If you want a discreet vaping experience, then you got it with Yocan Evolve 2.0! It is small and compact that you can fit it in your palm for stealth vaping. Now, you can vape your favorite e-juice, oil, or concentrate discreetly! The oil and juice refillable pod are specifically crafted with a ceramic coil, delivering a clean, smooth, and flavorful flavor every time. On the other hand, the concentrate pod is crafted with dual quartz coil which provides a smooth and crystal clean essence. Customize your vaping experience with Yocan Evolve 2.0’s adjustable voltage options. There are three power levels including low (indicated by white light), middle (blue light), and high (green light). Press the power button thrice rapidly once the device has been turned on so you can adjust the voltage level. The Yocan Evolve 2.0 provides an incredible experience with its built-in pre-heat function. It means that before your oils are consumed, they are warmed first so you can get the most of your favorite material, avoiding wastage. You’re confident that every tiny little bit of juice, oil, or concentrate is consumed and are not accumulated in your pods. It makes cleaning and maintenance easier! That means less stress and hassle for you, and just pure enjoyment experienced while vaping! In addition, you can save more money because you get the most out of your favorite material every time without putting it to waste. Simply click the power button twice to activate the preheat mode, which will last for 10 seconds. You can deactivate the preheating function by simply pressing the power button twice again. It is your discretion to activate or deactivate the preheating function, though we highly recommend you use it for the benefits it can provide. Besides, it only takes 10 seconds which is virtually wait-free! But of course, if you’re excited to vape or simply don’t have time to wait, you can go ahead and deactivate the pre-heating function. This is an innovative feature that most vaporizers adopt today. Why not? With the magnetic connection between the pod and the battery, you have a peace of mind changing pods easily. Your desired pod is positioned and placed securely, avoiding being dropped or accidentally disassembled from the device, most especially if you’re charging your device. It makes a vaping operation more seamless and convenient. No more messy juices and loose pod connections! The Yocan Evolve 2.0 has a built-in USB charging so you can charge it anywhere using a power cord. It is very convenient to use while you are on the go. You have four color options with Yocan Evolve 2.0 which include black, silver, champagne gold, and rose gold. Choose black or silver for a masculine, formal, and bold look and appeal, whereas champagne gold and rose gold depict elegance, sophistication, and uniqueness. Choose what color best suits your gender, preference, or mood! The Yocan Evolve 2.0 is a worthy investment. Why? 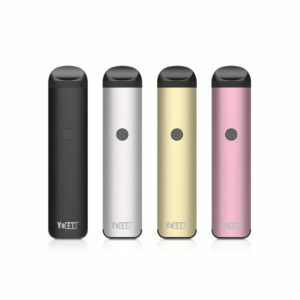 It is because this pod-based vaporizer provides an excellent heating performance with its advanced heating technology, superior portability, versatility, and easy vaping operation. Attend concerts, party all night long, travel and multitask with Yocan Evolve 2.0. It is perfect for everyday use, most especially if you’re on the go. Say goodbye to bulky and complex vape operations. In just one button, click thrice rapidly to change voltage settings or twice to activate the pre-heat function. In addition, this device is almost maintenance-free and charging is a breeze with its magnetic connection for your peace of mind. You’ll never regret buying a Yocan Evolve 2.0 vaporizer! Generally, customers are happy and satisfied with Yocan Evolve 2.0 pod-based vaporizer. Some people might be worried about misplacing the device because it is small and compact, but these qualities are a huge advantage for many, most especially those who prefer discreet vaping and avoiding carrying bulky vapes. Yocan Evolve 2.0 is a breakthrough pod-based vaporizer that allows you to change refillable pods for e-juice, oil, or concentrate. It is an all-in-one device that has a smart design and very convenient to use. Say goodbye to bulky and multiple jar containers for different vaping materials because the Yocan Evolve 2.0 makes vaping operation a lot easier! The post Yocan Evolve 2.0 Review appeared first on Smoking With Style.